With iOS 10 onwards, you can use rich push notifications to enhance the user experience and communicate with mobile app audiences in a more creative and interactive way - using images, audio and video. Before using these features, your developers need to make the following changes. a) Image (iOS Version 10 & above and MoEngage SDK Version 3.0.0 & above only) - This enables an image to be shown in the push message.The image can be uploaded either via i) a URL, or via ii) dragging & dropping or uploading an image from system. 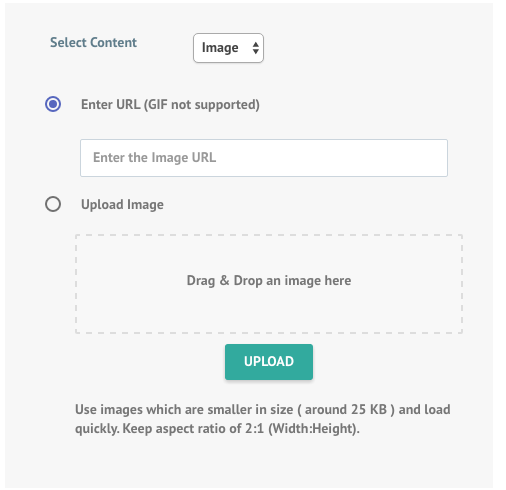 Supported image formats are JPEG, PNG and GIF. The maximum allowed size is 10 MB for iOS. b) Video (for iOS only - iOS Version 10 & above and MoEngage SDK Version 3.0.0 & above) - Enables you to attach a video to your iOS Notification. The video file should be hosted somewhere and be directly play-able. iOS 10 supports MPEG, MPEG2, MPEG4 & AVI formats of video. The maximum size of videos should be less than 50 MB. c) Audio snippet (for iOS only - iOS Version 10 and above and MoEngage SDK Version 3.0.0 and above) - Enables you to attach an audio snippet to your iOS Notification.The audio file should be hosted somewhere and be directly play-able. iOS 10 supports .wav and .mp3 formats of audio files. The maximum allowed size of audio piece should be less than 5 MB.